Voted best Solera Rum in the world. Golden Barrel awards 2010. 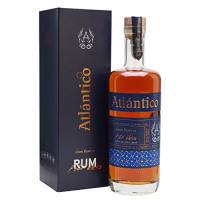 Atlantico Rum, produced in the Dominican Republic, is a unique distinct dark rum that embodies tradition, sophistication, and hand crafted quality. Appearance: Deep yellow, fat legs. Nose: Vanilla and bread dough. Palate: A shock of sweetness out front turns to caramel and butter rum. Finish: The sugar cane sweetness returns as it clings to the palate and delivers a medium-length finish with some herbal notes and greater complexity. The rum made its debut in South Florida and the Dominican Republic in October 2008, has already been described and praised by top spirits connoisseurs as "delicious, unlike anything else on the market" and a "Rum Masterpiece." The process for Atlantico Rum begins with handpicking the finest small batched aged rums in the Dominican. Once selected, the rums are blended together under the watchful eye of the master blender and placed in small bourbon barrels (private casks) and aged again for 1 to 2 years. This "marrying" process allows the different rums to interact with one another and produce a more complex spirit. Next, the rum is removed from the private casks and placed into another set of barrels and aged again for 15 to 25 years using the complex solera method (most typically used to produce sherry). The weathering elements during the dry and rainy seasons, the topography, and the constant Caribbean sea breeze from the coastline of the Dominican Republic positively affect the wooden barrels and liquid contained within, further developing and enhancing the flavour, resulting in a final product that is incredibly complex and smooth. Finally, the rum is bottled by hand and each bottle is carefully inspected, approved and hand initialled by its creators before shipping.